04 Noviembre: Oncativo / Sala Chica del Teatro Municipal Victoria-21 hs. 07 Diciembre: Comodoro Rivadavia / Sala Centro teatro 21hs. 08 Diciembre: Puerto Deseado / Teatro San José 21hs. 09 Diciembre: Las Heras/ Auditorio Juan XXIII 21hs. 13 Diciembre: Puerto Santa Cruz / Centro Cultural 21hs. 17 Diciembre: Rio Turbio / Sala Teatro 21hs. 20 Diciembre: Rio Gallegos / Complejo Cultural 21hs. Luego de presentar su trío Electrik Consort en el ultimo año, el stickista regresa a Argentina en compania de la cantante americana Linda Cushma para una gira por 22 ciudades argentinas. Difusor del Stick y uno de los pocos ejecutantes de este particular instrumento, Cides vuelve a los escenarios a ofrecer su particular punto de vista acerca de la música instrumental en un concierto intimista como único. Las andanzas de Mr. Cides en el 2005 lo llevaron a presentar un novedoso trío de instrumentos inusuales con músicos europeos/americanos, a la vez que comenzaba la grabación del álbum CCA Project (Cides, Linda Cushma y Tim Alexander de Primus), con Trey Gunn y Tony Levin de invitados. Ahora regresa en su formato preferido de performance solista, donde los sonidos y las melodías provenientes de su Stick de 10 cuerdas son la característica que marcaron su estilo. En un concierto donde la imaginación se mezcla con las posibilidades instrumentales, el músico también utiliza una técnica consistente en grabar sonidos en el escenario en el mismo momento en que los toca. Ha participado como invitado en conciertos de Roger Hodgson (Supertramp); Jethro Tull, Emmerson, Like & Palmer; Fish; Rick Wakeman (Yes); Trey Gunn (King Crimson) y varios artistas argentinos de diferentes estilos como Lito Vitale, Liliana Herrero o Biravent. Fundó Stick Center en Argentina y España, una asociación destinada a promocionar la música del Stick, un invento del californiano Emmett Chapman. Editó cuatro álbumes, entre los que se destaca el Tributo a Bach con Stick, y el reciente Compilado de Stickistas con 22 artistas hispanos. Actualmente colabora con las revista españolas Guitarra Actual, Bajista y Revista de Jazz en su sección Las Páginas de Stick Center. Para esta gira lo acompañará su amiga de aventuras Linda Cushma (Stick, voces, batería). La cantante vive en Arizona y viaja habitualmente a Europa por conciertos. Su trabajo anterior fue con Oxygene Eight y actualmente toca con su propia banda Ezoo formada por músicos mexicanos. Su siguiente proyecto discográfico es CCA Project, que será presentado en los siguientes meses. Baterista, bajista, stickista, cantante y actriz, Cushma es una artista inquieta buscadoras de nuevas formas musicales. “Cides hizo realidad lo que tuve en mente cuando diseñe el instrumento.” Emmett Chapman, inventor del Stick. Agradecemos la difusión de estos artistas. After presenting his trío Electrik Consort in the last tour, the Stickista returns to Argentina in company of the American singer Linda Cushma. Diffuser of the Stick and one of few performers of this particular instrument, Cides is back to the stage--offering his particular point of view about the instrument and the music in a concert both intimate as well as unique. The tour will cover 22 Argentinean cities. The adventures of Mr. Cides in 2005 led to the presentation of a novel trío of unusual instruments with European/American musicians, while at this same time beginning the recording of an album -- the CCA Project (Cides, Linda Cushma and Tim Alexander of Primus), with Trey Gunn and Tony Levin as guests. Now he returns to his favorite format of soloist performance, where the sounds and the melodíes coming from his Stick of 10 strings characteristically mark his style. 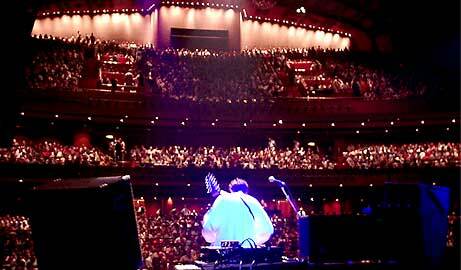 In a concert where the imagination mixes with the instrumental possibilities, this musician also uses a technique of recording sounds on the stage in the same moment in which the sounds are played. Cides, relocating to Barcelona years ago, has commented in interviews, " ... the artístic exile happens for several reasons: from a simple economic matter, to an absence of interest and structure of a country to take care of its artists. Many of these reasons led me to establishing a base in Spain through these last years, even long before the crisis, as do so many other emigrated artists. This "cultural fugue" strengthens many foreign countries - principally Spain, which every day welcomes writers, film directors, musicians, ballet dancers and artists in general that must look for new horizons far from their countries. For my part, I return every year to my country Argentina to play concerts for two month in an automanaged tour organized for particular persons who fight for another cultural identity. I do it for ideologic reasons, more than for devaluated reasons of pesos and euros." He has been invited to join the concerts of Roger Hodgson (Supertramp); Emmerson, Lake and Palmer; Fish; Rick Wakeman (Yes); Trey Gunn (King Crimson) and several Argentinean artists of different styles as Lito Vitale, Liliana Herrero and Biravent. He is the founder of the Stick Center in Argentina and Spain, an asociation designed to promote the music of the Stick, an invention of Californian Emmett Chapman. He has produced four albums, "El Mundo Interior de los Planetas," "Primitivo," the brilliant "The Bach Tribute,"--completely played with the Stick--and the recent Compilation of Stickistas with 22 Hispanic artists. At present he collaborates with the Spanish magazine Guitarra Actual and Bajista y Revista de Jazz with featured section, "The Stick Center Pages." For this tour he will be joined by his friend of many adventures, Linda Cushma (Stick, voices, percussion). The singer lives in Arizona and travels frequently to Europe to perform concerts. She presently works with OXYGENE8 and the band EZOO formed with musicians from Mexicali, Mexico. Her discography collaboration with the CCA Project will be presented in the following months. Drummer, bassist, stickista, singer and actress, Cushma is a restless artist and seeker of new musical forms. This will be a different concert. "Cides has made become real what I had in my mind when I designed the instrument." Emmett Chapman, Stick inventor. We thank the contributions of these artists.